Although we may not quite fit into the sleek spandex superhero suit that dominates our children’s entertainment, there certainly are other ways in which we can become a hero to our children. The problem for many parents is that they want to become friends with their children, rather than heroes. Our children do not need more friends, and they certainly do not need their parents competing with their friends for their attention. A hero does not beg for attention or approval. Children do not need us to be cool – they need their parents to be parents. But, do our children need us to be heros to them as well? The answer to that is yes. But to understand this we should look at what a hero is first. A hero is not perfect. In fact, all the most interesting heroes have vulnerabilities. Superman has his kryptonite, Ironman has a weak heart, Batman is haunted by past trauma and the Hulk struggles with his emotions. Sounds pretty human and vulnerable to me! One of the first rules of being a hero is to accept that you are flawed. In my book “MORE A New philosophy For Exceptional Living” I discuss the concept of the double edged sword. On one side of the sword is our greatest strength and on the other is our greatest weakness. They are two side of the same thing. We can transform our flaws into something exceptional. 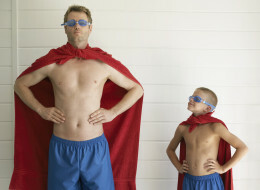 The superheroes mentioned above each found a way to transform challenge into growth. Download Chapters 1-3 of M.O.R.E. for Free! We’re happy to announce that the release of Alyson’s first book, M.O.R.E. : A New Philosophy for Exceptional Living, has been a tremendous success! In fact, M.O.R.E. has won the NIEA Indie Excellence Award in the category of “Well-Being” and has been named an Award-Winning Finalist in both the “Health: Psychology/Mental Health” and “Best New Non-Fiction” categories of the 2014 International Book Awards. More importantly, the feedback that we’ve received from all of our readers has been outstanding. To celebrate and get the word out to more people, we’re offering the first three chapters of M.O.R.E. for free! The only thing we ask in return is that you follow Alyson Jones & Associates through three of our social media channels. To download each of the first three chapters, follow the simple instructions below. 4 Simple Steps to MORE Money! First of all, let’s get this out of the way immediately: Money is not bad, nor is it at the root of all evil. Money is simply a medium that is exchanged for goods and services and measures the current market value of those goods and services. It is fear and greed that is at the root of all evil: the MORE philosophy is directed at moving you away from fear and into experiencing your life in a substantial and satisfying manner. So, how do you get MORE out of your money? Remember, this is not just about more money but rather getting a substantial and satisfying experience out of your money. In a recent counselling session, I was struck once again by how much perfectionism limits our potential. My client was a successful and accomplished woman who seemed to have it all in life but was not enjoying anything about her life. She could only list her shortcomings and was focused on how her “failures” left her feeling unsatisfied. There was nothing on the outside of her life that indicated she felt inadequate but when it came to the inside she was plagued with insecurity. This woman felt that she was not good enough and that, if people really knew her, they would be disappointed. This was a story I had heard many times before. Perfectionists may look successful but they are often hiding the deep dark secret that they feel like an imposter in their own lives. This is the skewed perception of the perfectionist. Somehow they have to be perfect to be accepted and, since it is impossible to be perfect, they cannot accept themselves. It is much like anorexia, as an anorexic has a skewed perception of their size and appearance. We know that most anorexics are struggling with perfectionism. Although not all perfectionists have physical anorexia, they may experience feelings of psychological anorexia where their self-perceptions are skewed and not based in reality. Psychological anorexia inhibits one from being able to enjoy the pleasures and sustenance that come from a satisfying experience. I sat down at the computer ready to go. The decision was made. I knew my topic and all I needed to do was start writing. I had begun to tell people I was going to write a book so I had better do it. As I stared at the blank screen I started to question the wisdom of announcing my intention to write a book. The idea sounded very cool and I must admit that I liked that people thought I had something to write about. However, the actual writing did not feel cool at all. I had always valued follow-through. I found myself annoyed with people who would make big announcements and then not follow-through. I did not want to be one of those people who talked the talk but did not walk the walk. “So write! Get going! ….oh, crap.” Not a very literary or professional thought at all! But that was the truth of my thought process. My thoughts had moved from creative intentions to outright panic. I had taken a weekend Mastermind Writers course that helped me outline my book. I had the chapter titles and a synopsis but alas, no book. The course had helped me tremendously although I had initially thought it was odd to be taking a writers course when I had not yet written anything. On reflection it was the perfect thing to do because it helped me get my ideas straight before I got too deeply set in bad habits. I actually loved the synopsis I wrote. It was smart, sharp, and no nonsense. This was the type of book I wanted to write. I wanted to avoid anything flaky and even hoped that some of my sense of humour would come through in my writings. “Where to start? Where to start? ….Oh crap!” There it was again ….panic.